Mr. Thomas has been working in front of and behind the camera for more than 25 years. Mr. Thomas is an Emmy Award Winning, Media Savvy, Creative Thinking, Broadcast Journalist, Educator and Business Owner with Television, Film and even Radio experience. He has been known to do it all! Mr. Thomas has always enjoyed a diverse role in every career path and nearly every one of those paths has revolved around Communication to an audience. Mr. Thomas began a career as an award winning Television Journalist and Anchor with Service Electric Cable, WBRE-TV, WNEP-TV and The New York Times. he continues now as both a teacher with the Parkland School District as well as with the Kathy Wickline Casting Agency in Philadelphia. Today, he us proud to continue educating and mentoring the next generation of Communication professionals by nurturing high school and college students as well as new and seasoned industry professionals. 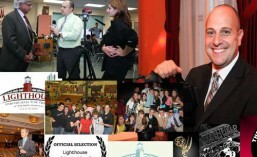 Through his award-winning high school programs and alumni outreach as well as his own production company, Dave’s students have found the confidence and connectivity to excel in this competitive atmosphere of the media as well as discover the beauty of the English language through the literature, plays and major works written for it. Dave used his networking contacts right from college and landed his first Anchor and Hosting job and continued as a host, anchor and reporter for more than a decade. His long list of famous people who have crossed his microphone includes President Bill Clinton, George Bush, Vice President Al Gore, Sir Elton John, Brittney Spears and even Jimmy Rollins and Chase Utley among dozens of other big name celebrities! However, always believing in capturing the moment while in the moment, Dave had the chance to study on-camera and vocal presence with Academy Award winning actor, Jack Palance, for two years. He has worked in both New York and Los Angeles on various projects ranging from the highly emotional post 9/11 coverage to surrounding himself with the naturally hilarious “Second-City” comedy veterans; Bonnie Hunt, Jim Belushi and Chris Barnes. He has produced several award-winning documentaries and is a current and judging member of the National Academy of the Television Arts & Sciences (NATAS) as well as an educator who continues to inspire dozens of students to conquer this competitive industry in every role. Most importantly, this is what he teaches you or your students.